In Noddlepod you can write, format and illustrate your text with images and embedded media. You can upload files directly from your computer or simply link to resources of relevance. Links to YouTube, Vimeo and other popular web sites automatically expand as an embedded resource. Administrator only functionality allows you to highlight important or official content to visually differentiate it from the community’s contributions. You can also “flag” a piece of content to make sure it always floats to the top of the activity stream. 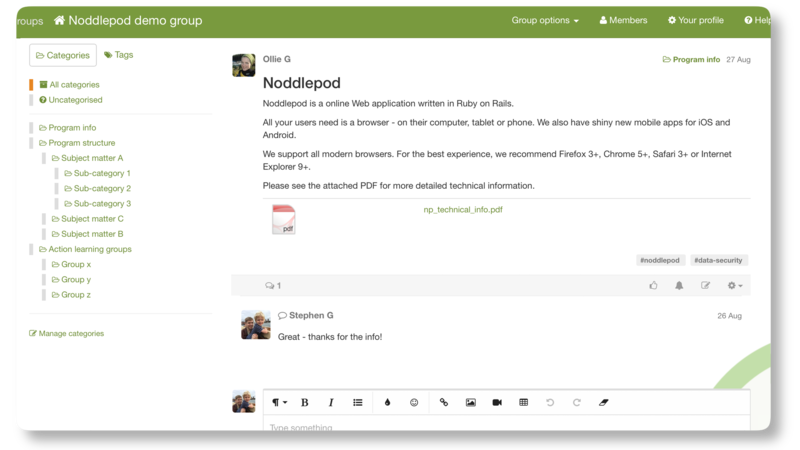 Noddlepod has been designed from the ground up with knowledge sharing and community building in mind. The user interface takes cues from social media platforms and forums that people are familiar with. All users can create their own content, share resources and insights, ask questions and have discussions with their peers. An individual piece of content can also be made collaborative, allowing users to create and edit content together. You can see different users’ contributions in the post history, and even compare and revert back to previous versions of a post. 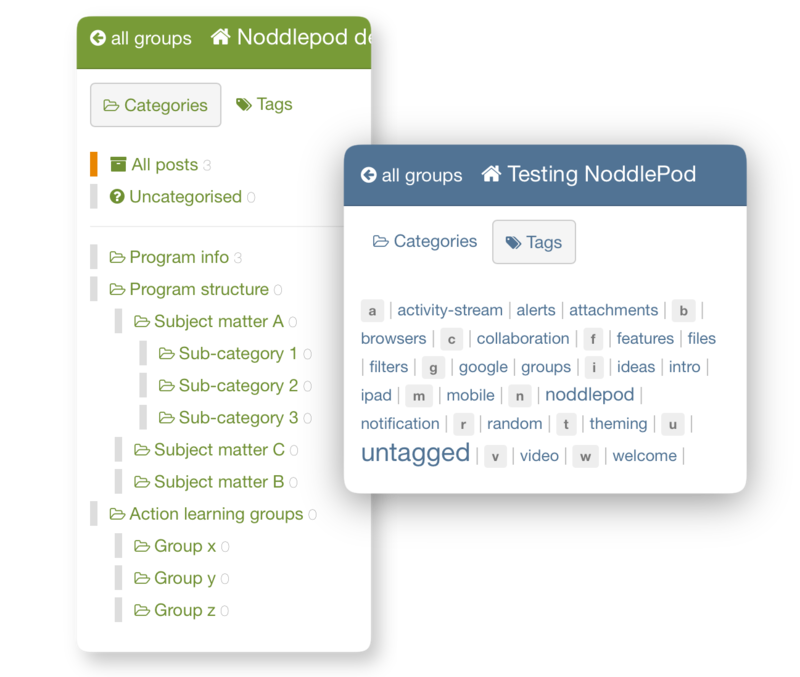 Each group on Noddlepod has a nested structure of categories, defining the scope of a project or community. Content can be quickly organised into these categories and tags, so it is easy to find in the future. Allowing quick and easy categorisation of content builds a knowledge database from the activity of the community, allowing members to build on each other’s ideas and learn from each other. Engage even the busiest in your groups by letting them define exactly what they want to be kept up-to-date with. Users can personalise the frequency and content of their email notifications right down to the level of the categories in each group. The categories you define in Noddlepod increases users’ signal-to-noise ratio, and reduces the time commitment required for valuable participation. Increased personal relevance translates into increased productivity, engagement and cross-pollination of ideas. Get the feedback you need to ensure your group stays productive and your community thrives. 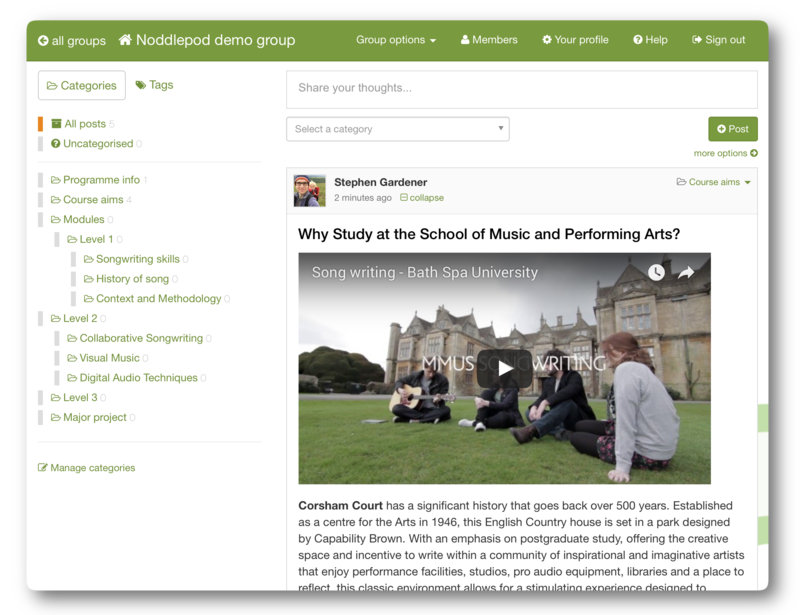 A group’s activity on Noddlepod can be analysed to give meaningful data on the engagement of participants, the interactions between them and the effectiveness of the group as a whole. Noddlepod analytics allow you to monitor how activity is distributed between categories. This can tell you who the experts are within each category or when participants are lagging behind schedule. Talk to us about what data is meaningful to you. We can create customised reports, and our amazing partners can help you turn data into insights and facilitation advice. Includes integrations with YouTube, Vimeo, plus an API and single sign on support. There are so many ways to create engaging and interactive content these days. Embed such resources into a post on Noddlepod and your users can browse that content without leaving the platform.